I'm wondering when I'll finally be online to update this blog. Although my motel promised wi-fi in room, their Internet connection was down. I'm at the University of Ohio, Newark Campus. After traveling over 2,500 miles, just by coincidence I arrived in Newark for "Earthworks Day." 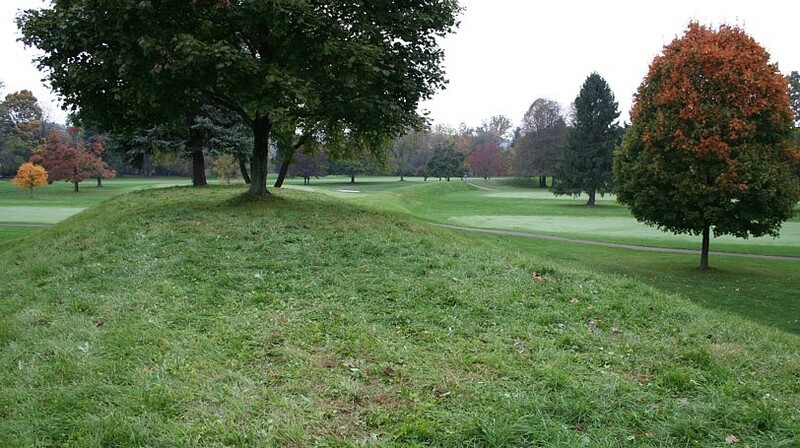 There is a grand cultural, art, and academic celebration of the wonder of the ancient world that is Newark Earthworks. And the coincidences began piling up. For years now, I've wanted to talk with Dr. William Romain, the author of Mysteries of the Hopewell. Just after arriving here in Reese Center, we happened upon each other and had a good talk for an hour. 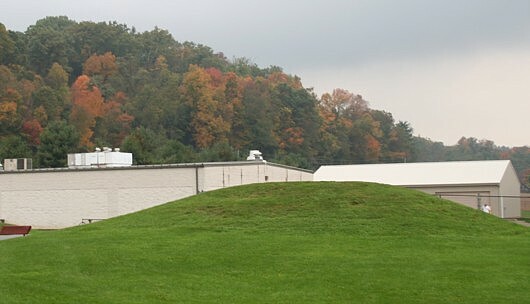 To discover more about Earthworks Day, go to http://www.octagonmoonrise.org. To read some of my research, go to the series of articles, Archaeogeodesy, a Key to Prehistory. My GPS readings are an improvement on my previous method of scaling coordinates from topographic maps and a means of testing the accuracy of that method. I hope they will yield more results to report later. You can also download Arc_Calc_3, a small Excel spherical trigonometry calculator to determine arc distance and bearings for three sites. You just input the coordinates. 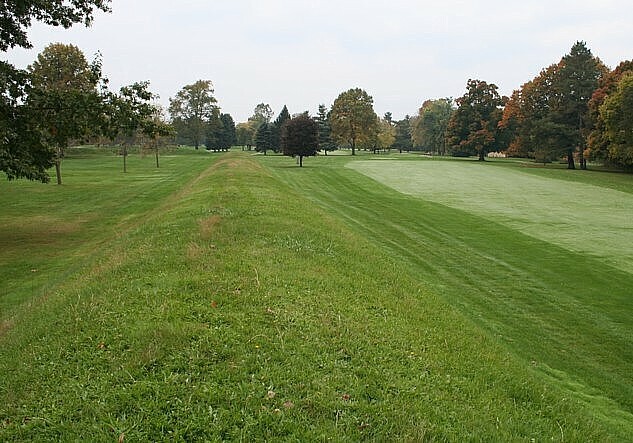 The largest and most impressive of all the earthworks in North America. The Octagon and attached circle in the upper-left, NW area is almost 3,000 feet long. I just attended lectures by Dr. Ray Hively and Dr. Robert Horn, publishers of the alignments of the Newark Octagon to the lunar standstills. They presented their fascinating data and a great comparison of the scale of the Newark Earthworks to other great monuments. You can fit the Great Pyramid in the square at Newark with over 100 feet to spare. Stonehenge's Sarsen Circle fits inside the tiny circle immediately adjacent to the Octagon with lots of room to spare. The site once covered several square miles. I'm waiting for another lecture instead of running off to the earthworks with camera and GPS. Another well-known Hopewell authority, Dr. Bradley Lepper is presenting "The Newark Earthworks: A Wonder of the Ancient World" in a few minutes. The sun is out again after good rains today, and I hope that holds for tomorrow. Moonrise over the Octagon should be spectacular tonight. To add to the coincidence list today, someone I knew online only, fellow Hopewell researcher Joe Knapp, had signed a sheet set out by the local archaeology society. I saw his name, spoke his name loud enough to carry in the crowd, and there he was! Joe took photos during the Horn and Hively lecture, and I moved the images to this hard drive by USB interface. The next image shows several of the relationships Horn and Hively presented, and illustrates how the center-to-center distance of several features at Newark equal six times the diameter of the 1054' true circle attached to the Octagon. This is but the tip of their iceberg! Back to the lectures, and to find a wi-fi hot spot that admits me. I'm discovering how difficult getting online can be. I had hoped to update this blog more often. I need to do that before Monday, when my good cyber-friend in Argentina, Mónica, will be showing this to her students. Well, I just asked the kind woman at the next computer to help. Now I'm logged in with her name and password, and can upload. Hooray. Ohio has the nicest people. It's another late night and this time the wi-fi works, if I go to the lobby hot spot. Time to upload after an edit, reformatting, and spell checking. I've been doing this on the fly, and that was certainly needed. Let me know if you spot any errors. In the morning, I'm off to see the Newark Earthworks. I'm in a Technology Lab in John Marshall High School, the local high school. Steve Deem has kindly allowed me to plug in the laptop and work until the Grave Creek Archaeological Complex museum opens. So I've edited some photos of Newark. I'll get back to adding more images and text to these images later. I'm off to Grave Creek Mound. First, a trip to the HS library for the wi-fi connection and this upload. At this point we are taking a quantum leap in earthworks sizes. 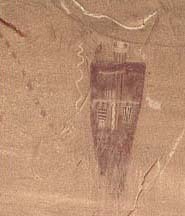 There is simply no way to photograph the entirety of the largest features at Newark Earthworks, except from high above in a balloon or airplane. 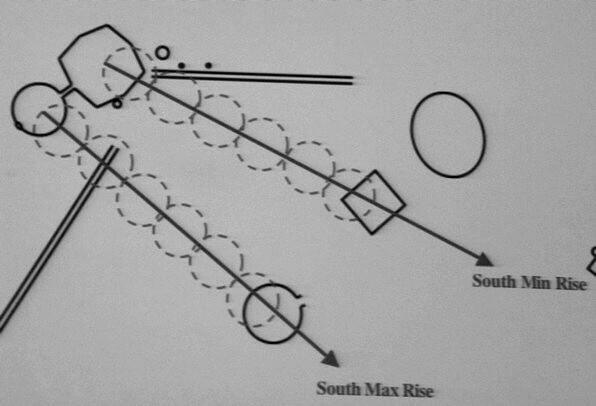 Marshall's survey measured the Great Circle at 1194' across. The actual shape is somewhat elliptical. The image above is taken from near the entranceway viewing the central mound, a large, arrow-shaped form that has also been described as a bird effigy. 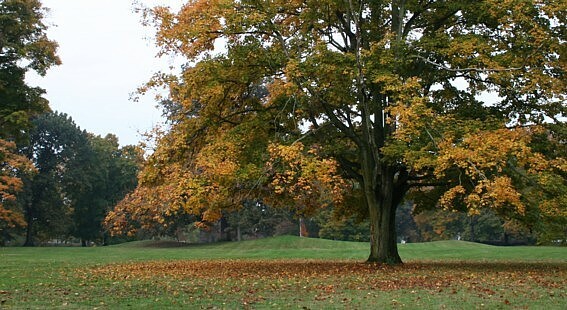 The three mounds visible below the giant maple are the central mound. The right and left mounds are either the wings or the edges of the arrow, or maybe just three eroded mounds. The form has four hummocks, with the fourth directly behind the center protuberance in this view. I arrived early, but footprints in the wet grass revealed an earlier visitor. Well over 1,000 people are participating in the Earthworks Celebration. As I began my first reading, a man walked into the gateway. I waved. He came over and we spoke. David Morgan, the archaeological illustrator well-known for his detailed images of Tikal and other Mayan ruins, had traveled from New Mexico to visit family and take part in Earthworks Day. He has GPS readings of Mayan ruins that I need! He only had a brief moment to visit the Great Circle before traveling homeward. One more amazing coincidence at Newark! The next view shows one of my GPS positions atop the Great Circle wall, about 8' high at this point. A trail follows the top all the way around. I took readings every 100 paces. Note the inner moat, a unique feature of the Great Circle. Moats and ditches are a common feature at some earthworks, including those in the British Isles. One plausible reason for these is borrow pits; the wall had to come from somewhere. Another practical reason may be for leveling. 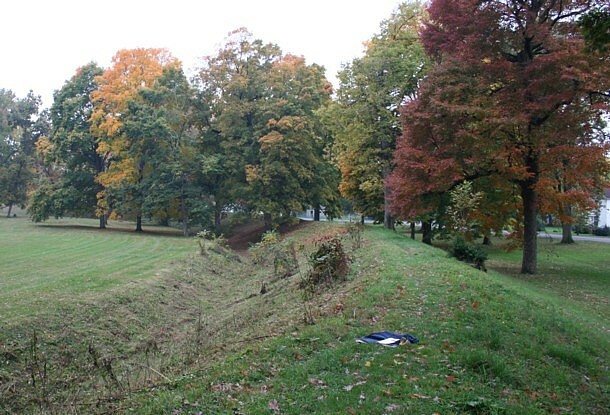 Water in a moat would serve to establish a level line for surveying or astronomical observations. Near the northeast parking area, I briefly met Robert Sharp and his family. They traveled from Chicago and Robert helped lead a group of Texas State University students visiting Hopewell sites and the Earthworks Celebration. Note another GPS reading ongoing on the background. The inner moat is deeper at the entrance, as are the walls at 14 feet, creating a dramatic entryway. The walls turn at the entryway to form parallel walls extending outward from the circle. The wide-angle view above is from one entrance wall viewing the other. The opening faces east-northeast and aligns to lunar minor rising. The largest feature at Newark, and the one creating the greatest scientific excitement, is the Octagon and attached circle. The Octagon encloses 50 acres, the Octagon Circle 20 acres. According to Thomas (1894), the Newark Octagon measures 1483' by 1714' and is oriented 51.450f E. of N. The High Bank Octagon is 1006.5' by 1261 and oriented 36.467f W. of N., perpendicular to the Newark Octagon. Marshall (1987) surveyed the overall length of the works at 2147.2' for High Bank and 2898.5' for Newark. Marshall's survey at Newark produced a 52.1f azimuth for the Octagon Circle. From the geodesy perspective, I find the near coincidence with the angles subtended by equal angular units of latitude and longitude at the local latitudes most interesting. Hively and Horn noted the coincidence between these orientations and the lunar major standstill angles. The first image below is taken from atop one wall at the central causeway, looking along the octagon wall north-northwest. 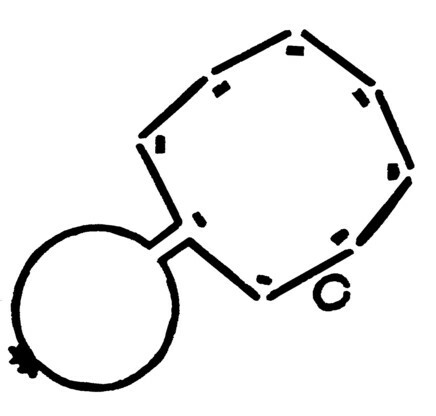 In the photo above, the length of a single octagon wall is well illustrated, as is the accuracy of lines. Below, the small circle that easily can contain Stonehenge's Sarsen Circle is situated near a wall. The center of the circle is a golf green today. While I find it appalling that one of the wonders of the world is a golf course, better that than a housing development or an agricultural plot, I guess. At least the earthwork is still there. All things in due time. X-Box fans, request this course on the next version of your favorite golf game! 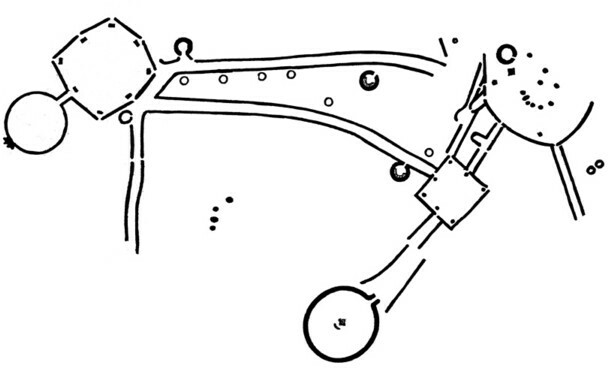 The image above illustrates the mounds found inside each opening in the octagon. 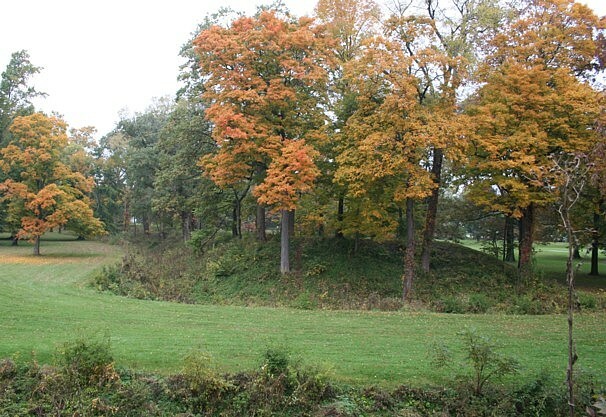 The following image shows the circle from the center of Observatory Mound. Observatory Mound is attached to the edge of the circle directly opposite the causeway to the octagon. The second image following views in the other direction from the southeast end of Observatory Mound. The corners of the Great Pyramid would inscribe a circle about the same size as this true circle. Newark Octagon Observatory Mound 40.051138 N., 82.450139 W.
The scene above is taken from near the center of the Octagon Circle viewing the causeway and the mound at the opening into the Octagon. 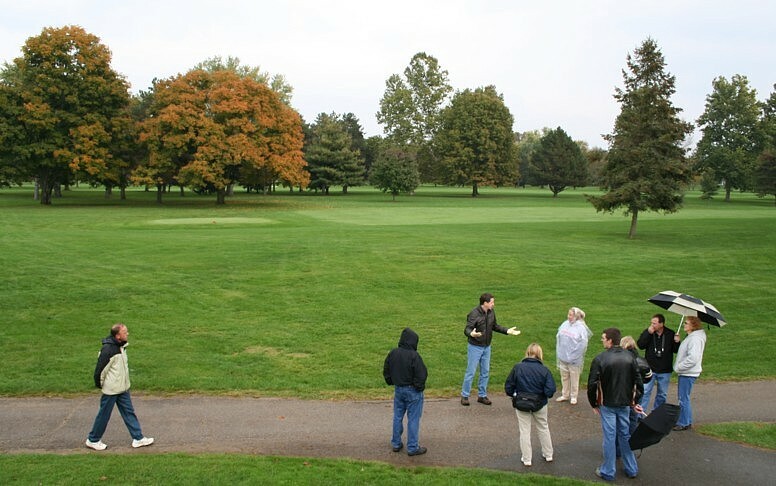 The following image was taken from atop the opening mound, next to the tee off, viewing cross the 50 acre octagon. Just after I took the last reading atop the Observatory Mound, the rains began anew. 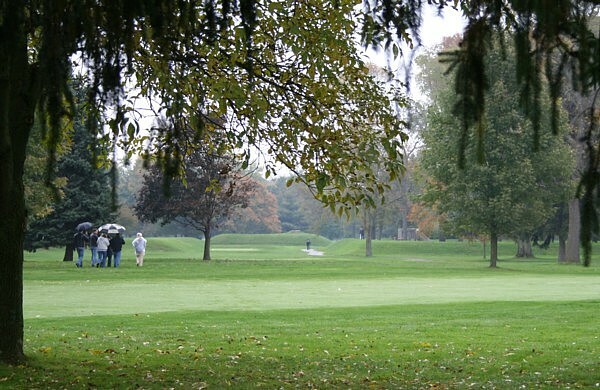 The golf course closed for the day to allow the public to experience the earthwork. In this last view, Dr. Bradley Lepper, discoverer of the The Great Hopewell Road, is providing interpretation for one of the groups. He stated that four Roman coliseums fit inside the Octagon! 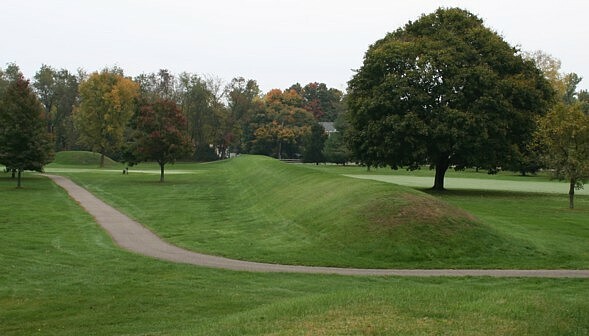 The Great Hopewell Road has been traced from the Newark Earthworks towards Chillicothe, and may have extended the entire distance, over 50 miles. Dr. Lepper's article is listed below. One of the other coincidences at the Earthworks Celebration was meeting Bryan Jacobs, no relation I'm guessing, but who knows. 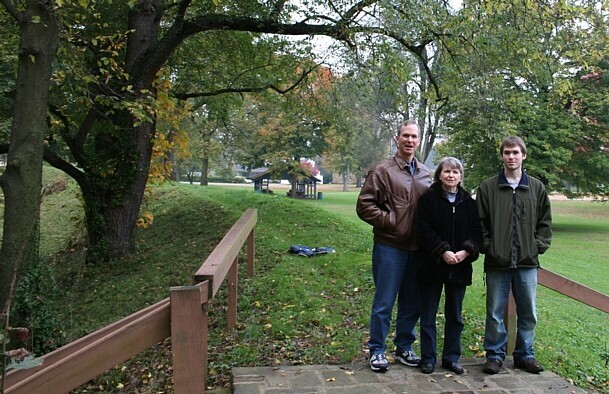 I heard Bryan introduce himself to someone and noted that he was an avid Hopewell researcher and knew the whereabouts of all the Newark Earthworks in detail. Needless to say, I sauntered on over to introduced myself. That's why I noticed Joe Knapp's name on the list at the Licking County Archaeological Society. Below you see Bryan providing scale on Alligator Mound. Bryan took several hours out of his busy homework schedule to navigate me to sites I would have taken all day to pinpoint. Thanks a heap, or a mound, Bryan. 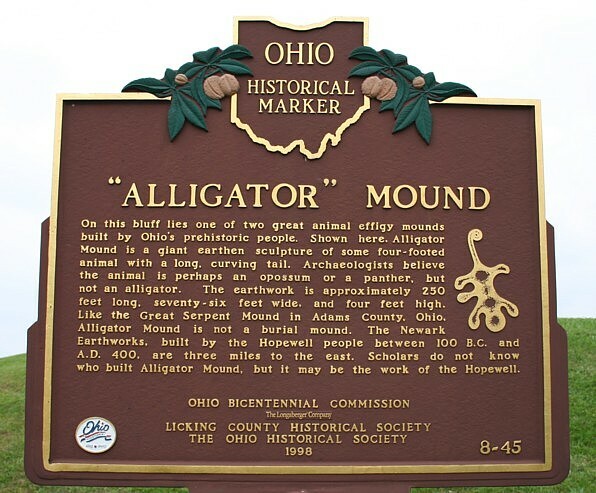 Alligator Mound is located on a hilltop northwest of the Earthworks. Alligator Mound 40.06983 N., 82.501028 W.
Note the GPS at Bryan's feet, atop the middle of the effigy's back. Owens Mound 40.075972 N., 82.445028 E.
Owens Mound is located due north of the Octagon Earthworks about 2.75 km. This was my last Newark stop before driving east to the Ohio River and West Virginia.